It goes without saying that music and lyrics compliment each other. In this digital age, where we can literally carry thousands of songs in our pockets, sometimes the experience is not complete without viewing the lyrics of a song while listening to it. Desktop based music like Windows Media Player, iTunes, Winamp, etc. 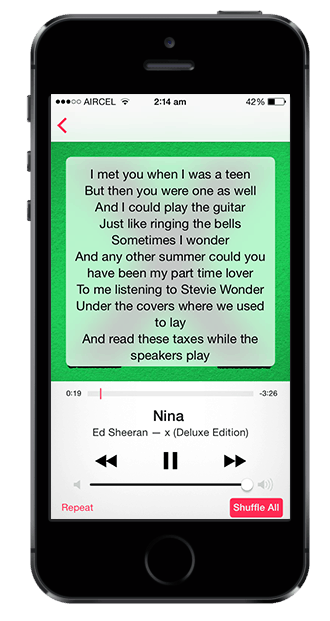 all have the option to embed lyrics into music files and view them while playing songs. Fortunately, it is also possible to view lyrics of songs on your smartphone while listening to them on the go. Talking about viewing lyrics on smartphones, some of you might argue that apps such as Musixmatch or Soundhound already provide a great lyrics viewing experience while playing songs from your library. One disadvantage of these apps though, is that they depend on continuous Internet connectivity. These apps do not download or save lyrics locally for offline use. You can embed lyrics to individual songs (files such as MP3, MP4) using Windows Media Player or iTunes, by editing their lyrics tag, for offline viewing. However, for typical music enthusiast, a music library might consist of hundreds or thousands of songs. Embedding lyrics in each of these files manually is almost impossible. In this article, we are going to find out how to automatically embed lyrics to your music collection on Windows and Mac, and then view the embedded lyrics on various platforms (Windows, Mac, iOS and Android). For embedding lyrics, we’re providing solutions for both Windows and Mac. However, these are third party solutions which work alongside iTunes (iTunes plugins). So in order to embed lyrics, it is mandatory that you have iTunes installed on your computer and that your music collection is imported into it. There are a number of applications that search the lyrics of a currently playing song and embed them into the file. But here we’ll be looking at applications that can perform bulk-embedding of lyrics to songs in your collection. Download and install LyricsXpert plugin for iTunes on your Windows PC. Ensure that the songs you want to embed lyrics to, are saved to an iTunes playlist. Launch LyricsXpert. iTunes should automatically launch along with it. Open the LyricsXpert File Menu and choose Load Playlist. From the Load Playlist menu choose either Music (to embed lyrics to all your music) or a particular playlist (to embed lyrics only to songs in that playlist). LyricsXpert will now search for lyrics online and embed them into the selected songs. LyricsXpert also has a Wizard mode to guide through the embedding process in a step by step manner. In addition to embedding lyrics, it can also perform additional functions such as removing broken iTunes links and embedding album artwork from album folder. Download and install Get Lyrical for Mac. Launch it by double-clicking on the application file. It should also launch iTunes along with it. If you want to embed lyrics to a particular album, open your Music collection in iTunes and choose the Albums View in the top right corner. Alternatively, if you want to embed lyrics to a playlist, select the Playlists tab from the top of the screen and choose the playlist you want to embed lyrics to. If you want to embed lyrics to a selected number of songs, choose the Songs view in the top right corner and go to the “My Music” tab. Now select the songs you want to embed lyrics into and switch to the Get Lyrical application. Click on Tag Selection button. Get Lyrical will now search the Internet and embed lyrics of the selected songs for offline viewing. Get Lyrical also has an Active Tagging mode that runs the app in background and embeds lyrics in all the songs played using iTunes. If you want to tag lyrics to an entire playlist, you may also do so by selecting the playlist in iTunes and choose “Tag Selected Playlist” from Get Lyrical File menu. Open Windows Media Player and go to the Now Playing screen by clicking on the “Switch to Now Playing” button at the bottom right corner of the player interface. Right click anywhere in Now Playing screen, and from the menu choose “Lyrics, captions and subtitles” >> On if available. Now play a song with embedded lyrics in Windows Media Player. Embedded lyrics will now be displayed at the bottom of the Now Playing screen. Download CoverVersion for Windows or Mac. Close iTunes if it is running. For Mac, open CoverVersion.dmg and copy the file CoverVersion. Now open the Go menu in Finder and hold down the Option key. The Library folder will now be listed. Place the copied file in “Library/iTunes/iTunes Plug-ins/” location of your home directory. For Windows, extract the downloaded zip file and place the CoverVersion.dll file in “C:\Users\username\App Data\Roaming\Apple Computer\iTunes\iTunes Plug-ins\” or “C:\Program Files\iTunes\Plug-ins” depending on the Windows version. Now open iTunes and choose CoverVersion visualizer from iTunes View menu >> Visualizer >> Cover Version. Now when you play a song with embedded lyrics on iTunes, activate the visualizer by going to the View menu >> Show Visualizer. iTunes will now display the song lyrics of the currently playing song. If you have recently embedded lyrics into your iTunes music, sync your iOS device using iTunes. This will copy your playlists to the device along with the embedded lyrics. Once all the music has been synced, disconnect the device from your computer and play a song with embedded lyrics in the Music app. Once the song starts playing, tap on the album art in the Now Playing Screen to display embedded lyrics. Tapping it again will remove the lyrics. Thus, you can view embedded lyrics on your iPhone, iPad or iPod Touch. If song lyrics have been recently embedded to your music files, copy them once again to your Android device. On the Android device, download Rocket Player from the Play Store. Launch the app and let it scan your music collection. Go to the music tab in Rocket Player and play a song from your collection. To view song lyrics, tap on More Options (the icon with three vertical dots) and choose Show Embedded Lyrics. To hide the lyrics, go to More Options and choose Hide Embedded Lyrics. Poweramp is also another similar app for Android that can display embedded song lyrics. Minilyrics (Embedded lyrics) – Available for Mac, iOS, Android and Windows. Musixmatch (Online lyrics) – Available for Mac, iOS, Android, Windows and Windows Phone. SoundHound (Online lyrics) – Available for iOS, Android and Windows Phone. Poweramp (Embedded lyrics) – Available for Android. We couldn’t find any decent music player for Windows Phone that displays embedded song lyrics. If you know of any such app, do let us know so that we can accordingly update the article.